Exchange Free/Busy Service – This component is responsible for accepting F/B requests from Lotus Notes (via QCALCON) for Exchange users, retrieving and processing the data, and returning it to QCALCON. QCALCON Task – This is a Domino server tasks from Quest which handles requests for Exchange user F/B information. These requests are sent to the Quest Exchange Free/Busy Service. Quest recommends that you separate the first two components on to two separate servers for performance reasons. They don’t make any data readily available as to when this is necessary, so you’ll need to make a judgment call and do some testing in the lab as to whether or not this is necessary. In a large environment, it’s possible to scale some of the components out behind a load balancer as well. In addition, Quest also recommends physical hardware in lieu of Virtual Machines, although my personal opinion is that given proper resource allocation, this guidance is stuck somewhere in the era of the Notes UI design. The way Quest integrates Notes F/B data with Exchange is clever, and to understand it, you’ll need to have a bit of background on how Outlook clients (and others) get F/B info. Prior to Exchange 2007, Exchange stored F/B information in Public Folders, and Outlook clients knew where to go in the Public Folder store to find the data. With the desire to move away from Public Folders, this information became available via Exchange Web Services (EWS), also sometimes called the Availability Service (AS). This is a SOAP based web service hosted on the CAS server and accessible via HTTPS. Outlook 2007 and newer knows how to access this endpoint as does Outlook for Mac and various other EWS clients. Exchange 2007 also introduced the ability to provide a means for cross-organization F/B info without any complex public folder replication. The way this works is you define an “availability address space” in Exchange which tells Exchange for a given subdomain, send those F/B requests over to a different AS endpoint. If you’re not familiar, take a look at this post before reading further. This functionality is what Quest leverages. What Quest has done is re-implement the Autodiscover service as well as the Availability Service such that Exchange thinks it’s talking to another Exchange organization, when in fact it’s actually talking to the Quest Domino F/B server. In Exchange, we define an availability address space for lotus.contoso.com which will resolve (via Autodiscover) to Q-LNFBC01. One to two servers to install the Quest components. For this example, I’ll use the two pictured above. A Lotus Notes server to install the QCALCON task. A standard Domino user ID file and password with mail file. Install PowerGUI on Q-EXFBC01 and Q-LNFBC01, and then Free/Busy coexistence components. The installers are quite self explanatory, so I won’t walk through those. 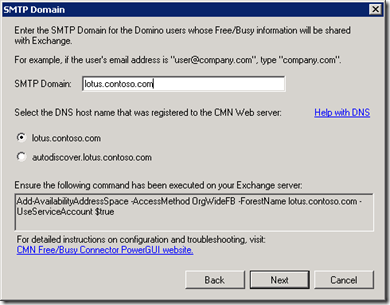 Be sure to only install “Web Server Components” and “Lotus Notes Components” on the Domino F/B server and the “Exchange Components” on the Exchange F/B server. Note: It’s possible to separate the Web Server components on to a separate server or set of load balanced servers if you have sufficient demand. For this walk through, I will assume they’re installed on Q-LNFBC01, though. 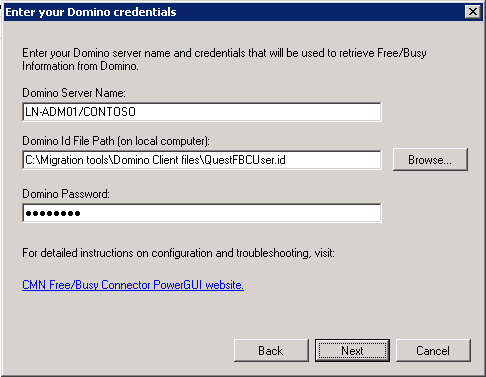 Once the installations are complete, we’ll use PowerGUI to configure the web services and Domino Free/Busy service. Browse to PowerGUI\CMN Free/Busy Connector Management\Configure Web Services and Lotus Notes Components in the Navigation Tree. Select Configuration Wizard from the task pane on the right. 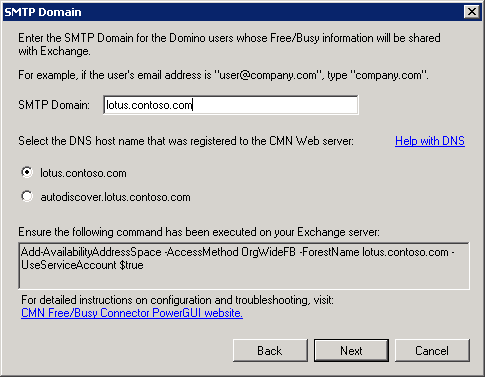 Configure an SMTP domain of lotus.contoso.com. Select autodiscover.lotus.contoso.com. Note: You must create a DNS A record for autodiscover.lotus.contoso.com which points to the IP of Q-LNFBC01. Start the “Quest CMN Domino Free/Busy Connector Service” service. Launch the Free Busy Connector Management Shell (Start>All Programs>Quest Software>Quest Coexistence Manager for Notes>Free Busy Connector). 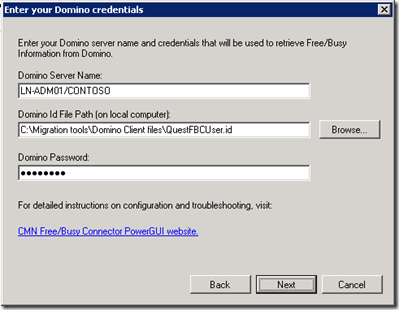 Restart the Quest CMN Domino Free/Busy Connector Service. Next, you’ll need to obtain an SSL certificate for the web services. While it’s possible to use a self signed certificate, your troubleshooting overhead will be substantially minimized if you obtain a proper trusted certificate. To obtain a certificate, you’ll need to generate a Certificate Signing Request (CSR). Launch Internet Information Services (IIS) Manager (start>run>inetmgr). Select Q-LNFBC01 in the COnnections tree. Double click Server Certificates in the center pane. Select Create Certificate Request in the task pane on the right. Enter a Common name of autodiscover.lotus.contoso.com and populate the request of the screen as appropriate. Upload the resultant CSR to your Certificate Authority (I recommend DigiCert if you don’t have a preference). Once you receive the certificate back from your CA, return to the Server Certificates view in IIS Manager. Select Complete Certificate Request in the task pane on the right. Browse to the file you received from your CA and complete the wizard. Browse to Q-LNFBC01\Sites\Default Web Site in the Connections pane. Select Bindings in the task pane at right. Find your SSL certificate in the SSL certificate drop-down. In the next post in this series, we’ll configure the Exchange Fee/Busy Connector and the Domino QCALCON server task.